Daniel fue suficientemente amable como para prestar un poco de su tiempo y responder algunas preguntas. ¿Cómo te iniciaste en la Perfumería? Me inicié en el mundo de la perfumería en el año 1998, en la compañía alemana de creación de perfumes Haarman & Reimer (actualmente Symrise). Allí trabajé con Jean Claude Ellena, que dirigía el Atelier Olfactif de esta compañía en Grasse, y quien fue mi jefe, maestro (llámalo como quieras) desde el año 1998 al 2004. ¿Cuánto tiempo pasó hasta que te animaste a lanzar tu propia marca? Mi línea de perfumes salió en 2012, así que estuve 14 años trabajando para la industria hasta que lancé mis propios perfumes (sigo trabajando para la industria hoy). ¿Qué propósitos tenías en mente al lanzar tu propia línea? La globalización de los mercados y la dimensión de la perfumería comercial hace que las grandes firmas necesiten de perfumes muy comerciales, fáciles de consumir. Cuando te diriges a un mercado de 120 países, por ejemplo, tu primera producción es de 250.000 piezas, gastas millones en publicidad, imagen etc, etc…el perfume tiene que gustar a todo el mundo sí o sí…y por tanto deben ir a productos fáciles, que saben que funcionan en el mercado y dejarse de “inventos raros”. Varios de tus perfumes llevan nombres (Cuero Toscano. Orquídea Negra) que se asemejan bastante a los de otras líneas ¿Cuál es el motivo? Cuando una marca quiere lanzar un perfume al mercado, llama a varias casas de perfumistas que trabajan el briefing y presentan unas creaciones para esa línea solicitada, entrando en concurso entre ellas. Al final hay un perfume elegido, ganador, que será el que sale al mercado…pero hay otros perfumes que concursaron en ese proyecto y nunca salieron…es la razón por la que algunos de mis perfumes tienen nombres que recuerdan a otros del mercado. ¿Cuál crees que es el sello de tus creaciones? ¿Qué materias primas son tus preferidas? De entre todas tus creaciones ¿Cuál te hace sentir más orgulloso? ¿Qué novedades podemos esperar en los próximos meses? Sobre las novedades…está a punto de salir un perfume del que espero mucho, que me encanta y creo que va a gustar mucho (eso deseo). Se llamara Bois d’Iris y estará disponible a inicios de diciembre ¡Esto es primicia! Y luego trabajando en muchas ideas de cara a 2015…algunas se quedarán por el camino y algunas saldrán, las que más ilusión me haga mostrar…aún están por definir. One of my most interesting discoveries this year was, without a doubt, the line created by Spanish nose Daniel Josier. During a fleeting visit to Madrid I was able to sniff his creations at Perfumería Nadia,when the charming Alicia insisted I try them. The uncomplicated packaging contains classic perfumes of a rare beauty (my favorite is the magnificent Golden Tuberose). Daniel was kind enough to share his precious time and answer a few questions. What was your start in Perfumery like? I started out in the world of Perfumery in 1998, at the German fragrance company Haarman & Reimer (now Symrise). There I worked with Jean Claude Ellena, who conducted the Atelier Olfactif of the company in Grasse. He was my boss, my mentor (call it whatever you will) from 1998 to 2004. How much time elapsed until you decided to launch your own brand? What purpose did you have in mind when you launched your line? Market globalization and the dimension of commercial perfumery makes the big firms require very commercial perfumes which are easy to sell. When you target a market of 120 countries, for instance, your first production is of approximately 250,000 bottles, you spend millions in advertising, image, etc, etc…that fragrance has to be likeable by everyone…so they must be easy products, which the companies know will do well in the market, they forget about “strange inventions”. So, from the point of view of the creator of the essence…the task becomes much more technical than creative. That’s why many noses come out to the market with their own lines, moving away from the “routine” of commercial perfumery, becoming able to showcase fragrance lines which are more creative, more intimate, stranger perhaps, for a more demanding audience which is usually also more knowledgeable and exclusive. 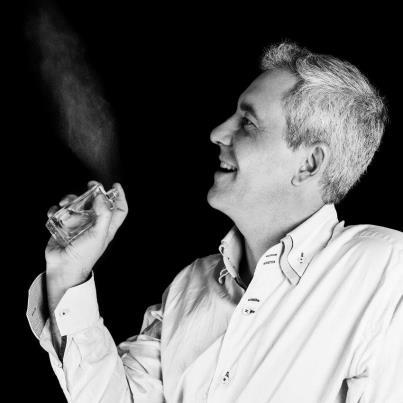 That was the reason for launching the Daniel Josier line: creating fragrances outside the market norm, more intimate creations where indulgence and the quality of raw materials are more important than marketing development. A few of your fragrances bear names (Cuero Toscano. Orquídea Negra) which are quite similar to those from other brands. Is there a reason behind this? When a brand wants to introduce a fragrance into the market, they call several fragrance companies, which then work on a briefing and present a few creations for that line, competing among them. In the end, there’s a chosen perfume, a winner, which will be launched to the market…but there are other fragrances which were involved in that project although they were never launched…that is the reason why some of my creations bear names that might remind of others already in existence. Which is the hallmark of your creations? The hallmark…perhaps the indulgence of raw material…I don’t search for a market trend, I search for the indulgence of the raw material and selecting the quality of the raw materials is essential. I have always admired Arabic perfumery and its ingredients, but my heritage is European and Mediterranean…I think it’s the fusion of these elements what describes my perfumes best. Which are your favorite raw materials? Which one of your creations makes you feel proudest? What news should we expect over the next months? I’m also working on many ideas for 2015…some of them will be abandoned, some of them will see the light, the ones I’ll be most illusioned about…but they still need to be defined. This entry was posted in Entrevistas - Interviews, Perfumes and tagged Daniel Josier, Nadia Perfumería. Bookmark the permalink.